The sensation of an electric shock running through your body is unpleasant, often painful, and, understandably, a source of fear and stress. It can be a sign of numerous conditions, but their causes continue to be poorly understood by science. It is worth taking the time to differentiate between the terms symptoms and signs, which are often used interchangeably. The symptoms refer to what is described by an individual experiencing a given sensation, whereas signs are what medical professionals see and identify. 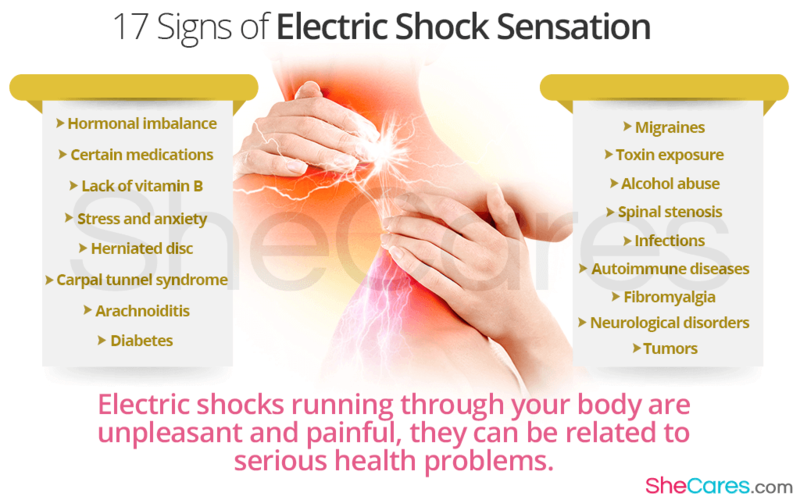 Continue reading to discover the most common signs of an electric shock sensation. Shifting hormones during pregnancy, menopause, or other stages of women's life, can bring about a wide range of symptoms, including an electric shock sensation all over the body. Medications to treat anxiety, depression, and migraines commonly cause electric shocks in various body parts. Low vitamin B12 can cause an electric-like sensation, which usually shoots down the arms and legs, especially while bending. Prolonged stress and anxiety are believed to exaggerate brain's response to various stimuli, often producing electric-like shocks and stabs in the head. Commonly known as slipped disc, it produces pain, weakness, and electric-like shocks in the lower extremities. It can also cause a sensation, called sciatica, which is a pain radiating down the leg. It is caused by an extensive pressure on the median nerve in the wrist. It produces tingling and electric-like sensations, numbness, and weakness in the hand and arm. It is an inflammation of the lining of the brain and spinal cord, and it is characterized by neurological problems, severe stinging, and electric-like shocks mainly in the lower back and legs. Poorly controlled diabetes can cause a diabetic peripheral neuropathy, characterized by pain and a radiating sensation of electric shock-like throbbing, especially in the feet and hands. Migraine is a debilitating condition, characterized by severe headache, throbbing and electric-like shocks on the sides of the head, nausea, and sensitivity to light. Exposure to harsh substances, like arsenic, have been associated with producing painful shock-like throbs in the head, as well as other life-threatening complications. Excessive alcohol consumption can cause irreversible damage to the peripheral nerves, resulting in various neurological symptoms, such as electric shock sensation. It is an age-related condition of narrowing of the opening of the spinal canal. It can affect the lower back regions and extend to limbs as well as head and neck, producing pain with electric shock feelings. Several microorganisms can cause various infections, such as shingles or HIV, which can result in painful electric shocks in all parts of the body. Diseases, such as celiac disease or lupus, might cause a wide range of symptoms, including pain, tingling, and electric shocks anywhere in the body. It is characterized by widespread muscoskeletal pain, often with electric-shock throbs, fatigue, as well as cognitive and mood disturbances. Epilepsy, multiple sclerosis, Parkinson's disease, and other neurological diseases often produce electric-like shock sensations all over the body. Tumors in various body regions might compress the nerves, causing them to misfire and produce sharp electric-like shocks stabs. Many women suffering from them undergo numerous tests in efforts to find the underlying cause, often without reaching a definite diagnosis. However, although electric shocks cannot always be explained by science, they should be adequately monitored and managed by your doctor to ensure they do not progress into a more serious condition.